Quiet room, very clean, in a nice area near Southern Village. All good. Nice amenities. Perhaps more TV channels. I like having access to food and drink in my hotel with a place to hang out. The lobby was unique to others we have stayed in. We got in late and left early but enjoyed a quick breakfast the staff kept it full and the coffee hot. I like the place! How looks like! The room was exactly what I needed! 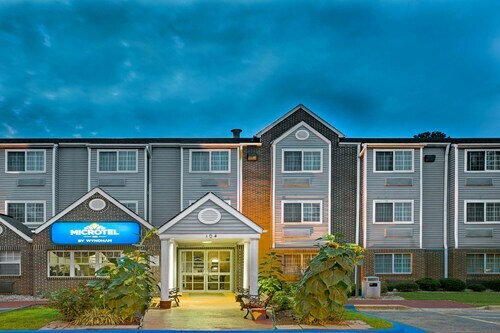 Extended Stay America - Raleigh - RTP - 4919 Miami Blvd. The Capital city of North Carolina, Raleigh offers a range of fun attractions and activities for every type of traveler. Be it a hike up the Neuse River Trail, exploring beautiful Pullen Park, or spending the day hopping between the North Carolina Museum of Art, the Museum of Natural Sciences, or the Museum of History, there is an abundance of reasons to spend a few days in Raleigh. For beer lovers, it is good to know that the city is also home to the world’s largest selection of beers on tap, over 366 to be exact. If you are looking for a fun area to stay in Raleigh with a youthful vibe, choose from the many hotels located next to the North Carolina State University. Located in the Southwest of the city, expect to share the streets with the 34,000 students that call this area home. For those traveling to Raleigh on business, stay in the city centre close to the Raleigh Convention Centre. Here, you will find many big name chain hotels, and be close to great restaurants to keep you fed after a long day of meetings. Pullen Park is a large city park in Raleigh, located close to the North Carolina State University campus. There is a multitude of things to do inside the park itself, be it visiting the Arts Centre, crossing the lake in a pedal boat, or going for a swim in the Aquatic Center. Stay in one of the Pullen Park hotels, that offer somewhere peaceful to spend your mornings. Should you come to Raleigh for shopping, then choosing your accommodation near the Raleigh Flea Market is a must. The market itself takes place between 9am and 6pm every Saturday and Sunday, and is a fun outing for the family with food, entertainment and great shopping. You can easily pick up bargains in jewelry, antiques, and unique pieces of furniture. Hotels in Raleigh cost from . 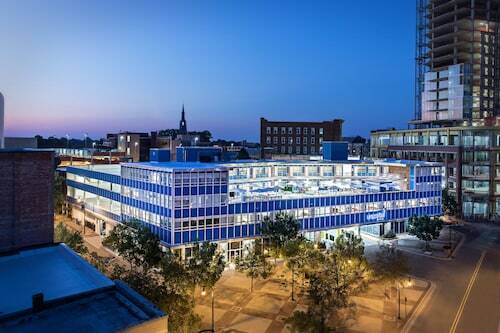 There are over 90 3 star hotels in Raleigh, offering a great number of amenities, such as free parking, hot breakfasts, high speed WiFi, as well as conference facilities and meeting rooms. If you are looking to upgrade to more stars, there are eight fantastic 4 star hotels in Raleigh that are sure to make for an incredible vacation. These hotels can be found in great locations within the city centre and come with high end amenities, such as an in-house golf course, a 24 hour fitness center, laundry services, or a library. While there is just one 5 star hotel in Raleigh, it is one that has been written about extensively and is in a class of its own. Expect spa treatments, luxurious bathrooms, an outdoor pool, and views to die for. A popular destination for business travelers, especially those travelling to conferences in Raleigh, there are over 218 business hotels in the city to choose from. For those hoping to travel to Raleigh with their four legged friend, it is a very pet friendly city with 116 pet friendly hotels happy to welcome both you and your furry friend. The nearest airport to Raleigh is the Raleigh-Durham International Airport, serving both domestic and international destinations, including London and Paris. It is located just 15 miles from the city center. There are ten hotels close to the Raleigh-Durham International Airport at your disposal, most on the budget-end of the star rating. Unscripted is a funky, eclectic hotel in the city center. Everything is within walking distance. The staff was very friendly and helpful. Our room was on the roof pool level and had such a fun vibe. I highly recommend this place to stay! The rooms were cozy and clean, and the parking lot was well lit.